Profile by Glenn Olsen: The Downy Woodpecker is North America's smallest woodpecker. At approximately 6 3/4 inches and just under an ounce in weight it is only slightly larger than a Tufted Titmouse. These diminutive woodpeckers are permanent residents of our neighborhoods, local parks, and open woodlands throughout the Upper Coast. Woodpeckers are the quintessential group of birds associated with trees. I think their Spanish name of Carpinteros embodies a fullness and sonority that is lacking in the English name. They are the carpenters of the bird world. 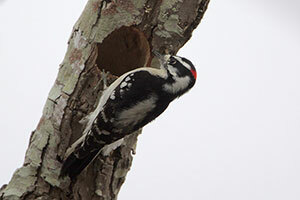 Like other woodpeckers, the Downy nests and roosts in cavities that it excavates in small dead limbs of trees. The holes are used as homes to raise young, to sleep in at night (roost), and to seek shelter from inclement weather and even to escape some predators. We can help the Downy by simply allowing a few dead limbs to remain on trees. Naturally, if the dead limb could easily fall on the house or a vehicle or present other danger, then it should be cut back to a safe length or removed. However, even a stub of a limb only about twelve inches in length and the diameter of a tangerine can provide a home for a Downy. This small stub does not present a real danger, so limbs could be cut back to this size for safety and to help a Downy. However, note that these small stubs are too small for our larger woodpeckers to use to excavate a cavity. 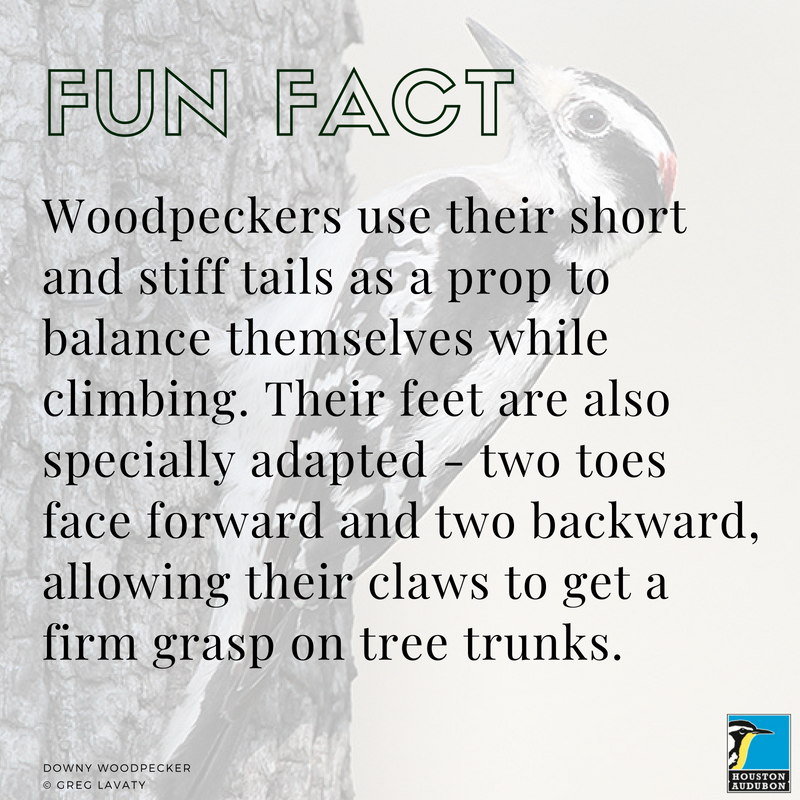 Leave larger limbs and standing trunks of about 30 feet or more in height to help our other woodpeckers. 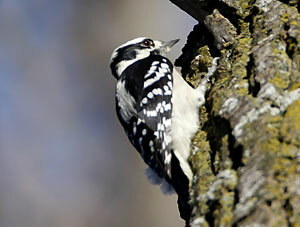 Like some other woodpeckers, the Downy feeds on insects which it searches for in trees and shrubs. Its small size and minimal weight allows it to feed on small branches, vines, shrubs, and at the tips of larger limbs. These small diameter limbs, stalks, and stems are generally too small for the larger woodpeckers to efficiently find food in so there is little direct competition with other species of woodpeckers. I have observed them searching for the larvae of gall wasps found in the bulbous stems (called a gall) of shrubs and small limbs of trees. We often use the word downy to indicate something that is delicate, soft, and light as a feather. What an appropriate name for our smallest woodpecker. Invite Downy Woodpeckers to Your Yard! If you have mature trees in your yard, you have good habitat for Downies. They rely on tall soft trees such as pines to excavate their nest cavities. Convert dead or dangerous trees to snags (20 feet or higher) which can be used for cavities. Downy Woodpeckers eat primarily insects; they readily visit suet and sunflower seed feeders.